Peader Byrne took the scoring plaudits as Ballinlough resisted a strong Ballinbrackey rally to claim the Meade Potato Company IFC title at Pairc Tailteann on Sunday. Byrne capped an industrious hour with eight points, but it took a squad effort from Ballinlough to fend off a spirited Ballinbrackey side that trimmed an eight-point deficit to the minimum with just eight minutes remaining. It's to Ballinlough's credit that they responded positively and closed in on their first IFC title since 1991 and claim possession of the Mattie McDonnell Cup, which honours one of their most illustrious clubmen. 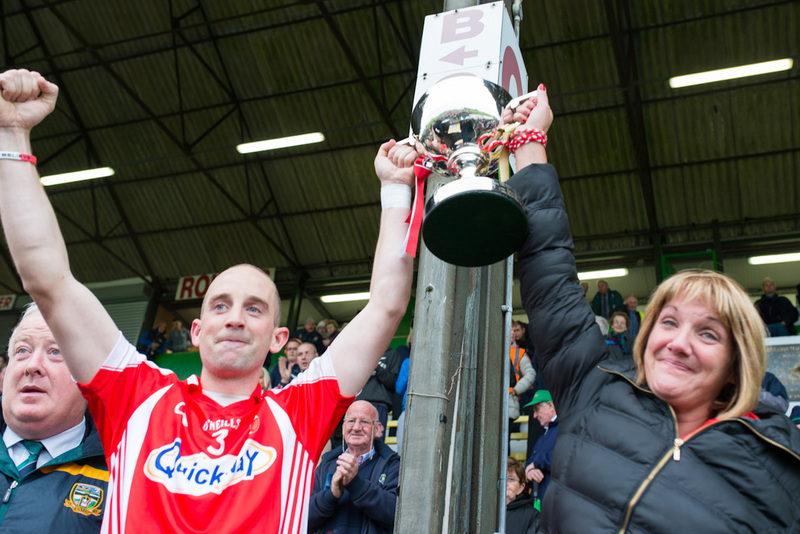 Captain Pauric Muldoon lifted the trophy alongside Ita McDermott, mother of the late Ricky, in a touching moment for the community. Ballinlough looked to be coasting to victory heading into the final third of the hour. Then with Damien Carroll driving them forward from midfield Ballinabrackey rallied to set up an exciting finale. Ballinlough were still four points to the good in the 52nd minute when Trevor Bannon flicked a Nicky Judge delivery to the net at the town end. Suddenly, Ballinabrackey were just a point in arrears. Ballinlough responded well, conceding no further scores and copperfastening the outcome with Byrne's fourth pointed free which was followed another such score from Kevin Devine. The 'Lough rearguard stood firm as Aidan Coffey's men valiantly tried for force an equalizing goal. Drizzle began to fall before action got underway. Playing into the town goal, Ballinlough were first to make an impression on the scoreboard with pointed frees from Kevin Devine and Peader Byrne. Byrne's effort was from 45 metres, in fourth minute. Buoyed up by those scores the Lough continued to dominate. The Ballinlough number 8 landed his second free in the 10th minute just before posting the game's first score from play. The board read 0-4 to 0-0 before Andrew Munnelly was wide with two point attempts in quick succession at the Commons Road end. Supporters from the south west corner of the county had something to cheer about in the 13th minute when midfielder Damien Carroll pointed. Throughout these early exchanges, the Ballinlough defence were the difference, driven on by the outstanding Robbie Farrell, who was first to the ball on almost every occasion. He was ably assisted by Benji Smith and Podge Muldoon in the full back line, who proved as difficult as ever to break down. Tommy McCullen became the third Ballinlough player to get off the mark as the game entered the second quarter when the board read 0-5 to 0-1. Another one-time county senior got off the mark, Chris O'Connor, as Ballinabrackey halved the deficit by half-time when the team in red and white led by 0-7 to 0-5. When Byrne brought his tally to 0-7 with 37 minutes gone that was the difference between the sides, 1-9 to 0-5. Damien Carroll's efforts helped Ballinabrackey get the gap down to four points before the end of the third quarter. Ballinabrackeys spirited late fightback was not enough, and the large contingent of Ballinlough supporters flooded the field in celebration. Huge credit must go to all these Ballinlough players, who have put in heroic effort over the last number of years. Keith McGuinness has become a mainstay of the team in goals, solid under pressure and with an impressive kickout that is the basis of so many successful attacks. He has pulled off some vitally important saves throughout the campaign. The full back line has excelled this year even more so than usual. Podge Muldoon fulfilling the perfect captains role, leading by example with his no nonsense style. He has been a rock at the back all year, and gave a great speech while accepting the trophy. Robbie Farrell put in a man of the match performance, winning every fifty fifty ball he went in for, and always using possession cleverly once he got it. The Crossakiel man is developing into one of the best corner backs in the county. Benji Smith in the other corner was as tight defensively as ever, yet always managed to be dynamic going forward, with pace to burn. He has been a standout performer for the club for a decade now, and still has many years left in him. Lorcan Maguire has been key since coming back from injury earlier in the year, his hard tackling was in full show on Sunday, as well as his ability to drive forward and launch an attack. He will relish a return to senior football, after experiencing it at a young age previously. Colm Mallen has adapted to his newfound home at centre back with ease. He has shown through the year that he is more than capable of man marking any forward in the county and keeping them quiet. He produced another heroic performance on Sunday. It’s hard to believe that Johnnie Reilly, the final member of the half back line, is still so young as he has become such an impressive performer. His pace and strength caused Ballinabrackey problems throughout the game, and he will be a part of this team for years to come. The turning point in Ballinlough’s year seemed to come when they paired Peadar Byrne and Derek Muldoon at midfield. The ex-county mans scoring exploits were on full display on Sunday, and indeed have been all year, with his impressive conversion rate of frees also vital in many games. Muldoon was once again the engine in the middle of the field on Sunday, as he worked tirelessly for the cause. So many team moves are instigated by the Kilskyre man, who is always ready to put his body on the line for the club. Mark McCullen scored the games all important goal with a fine finish to cap another masterful performance by the young half forward. His great fitness and strength ensure he’s an asset in both attack and defence. Sean Geraghty scored one of the games best points, and was a thorn in Ballinabrackeys side all afternoon. He has been one of Ballinloughs most consistent performers all year and should flourish in the senior grade. Cian Mallen was another tireless worker on Sunday, the half forward must have covered every blade of grass on Pairc Tailteann. His fitness and ability to drop back as an extra defender when needed has been a large part of the reason for Ballinloughs success this year. Ronan McGuinness has been an important player for the ‘Lough over the past number of years, but his performances this year have been his best yet. His tenacious style ensures that the forwards really are the first line of defence, while in attack he always has the ability to lose his man and has popped up with a number of essential points throughout the campaign. Tommy McCullen has developed into a top quality full forward, emphasized by his great performance on Sunday, capped with a fine score. He has shown a great ability all year to gain possession no matter what kind of ball is played into him, and with age on his side, he’ll be a big player for the ‘Lough for years to come. Kevin Devine continued his great year with another accomplished performance on Sunday. His experience showed in the later stages, as he helped settle the younger players and prevented them panicking. He also converted two excellent frees on the day. The ‘Lough have shown all year that it really is a squad game and that was true once again on Sunday as the bench was used to good effect. Simon Deevy was the first on to replace the injured Derek Muldoon, and instantly posed problems in the Ballinabrackey full back line. His strength and ball winning ability was of huge benefit in the second half. Player / Selector Ken Rothwell used his experience well when introduced, and has been a great impact sub this year. Similarly, Junior Reilly put in a great shift when brought on, and could find himself fighting for a starting position next year if he continues as he is. A special mention must also go to Tom Shine, and his management team of Gary McDonnell, John Reilly and Ken Rothwell, who masterminded this great success, which Ballinlough will remember for years to come. Ballinlough - Keith McGuinness; Benji Smith, Pauric Muldoon (C), Robbie Farrell; Lorcan Maguire, Colm Mallon, Johnnie Reilly; Peader Byrne (0-8, 4fs), Derek Muldoon; Mark McCullen (1-0), Sean Geraghty (0-1), Cian Mallen; Ronan McGuinness, Tommy McCullen (0-1), Kevin Devine (0-1f). Subs - Simon Deevy for Derek Muldoon (35), Ken Rothwell (0-1) for Tommy McCullen (black card 53), Junior Reilly for Mark McCullen (53). Ballinabrackey - Ger Crehan; Michael Kearney, Derek Flynn, Kevin Darby; Daire Kennedy, Nicky Judge, Pat Loftus; Damien Carroll (0-3, 1f), Chris O'Connor (C) (0-1); Seamus Curry (0-1 f), Andrew Munnelly (0-1), Trevor Bannon (1-0); Vinny Mooney, Danny Quinn (0-3, 1f), Evan Daly. Subs - Neville Brazil for Daly (36), David Thompson for Bannon (59).